My whole life the greed of people has disgusted me. How society can go from one "gimme" holiday (Halloween) to the next (Christmas) completely ignoring the only holiday of gratitude. I have vehemently, almost religiously waited until December 1st before the word "Christmas" escaped my lips. But for some reason, this year has been different. I broke down. I couldn't hold out any longer. It all started with this delicious fluff falling from the sky, blanketing the world in a haze of coziness, hot cocoa, and Christmas music. I turned on the radio this morning to a Christmas station. I thought it was nice. Cleaning the house, playing with the kids while it snowed, all the while having Johnny Mathis crooning Christmas carols softly in the background. And so, I am all wrapped up in my afghan, beneath the glow of the Christmas lights and they jovial smile of a Santa doll, letting the Christmas spirit seep in. This year is going to be so much better than last! Granted I had a new born baby so decorating was never fully finished. Our poor sad tree! It never got decorated. This year I solved that problem. I found an old rustic ladder that was destined for the dump. It was reeking with charm. So I saved it, not knowing what to do with it. I want to hang it on my wall with family photos between each rung. If I could just figure out how to secure it to the wall. In the meantime, we have a Christmas Ladder that is decorated, and ready for gifts to go around and on it. Darling! Solves the no tree dilemma. And I am in love with it. Unfortunately, I can't find my SD card converter. Just imagine simplicity and cuteness (in my humble opinion). When I find it, I will post pictures. I have not forgotten Thanksgiving. I am very excited for it (read my last post), but for some reason, things are just a lot more related in my mind than ever before. Christmas isn't so much about the "Gimme" as it is about gratitude. So I don't feel so bad about beginning Christmas a little early this year. I just get to celebrate and give thanks for all my blessings that much longer. What a great season this is going to be. 1~ The Crooners making Christmas albums. Nothing to make you happy and in the mood for Christmas like one of the Crooners! 2~ Christmas decorations. Dollar decor from Target is divine. 3~ Preschool. Getting together with some of my friends and letting our kids play while we pretend to have a preschool for the kids, but really it is an excuse for us to have some adult interaction. And craft a little. Boy oh boy do I love it! 4~My warm bed and snuggly flannel sheets. Flannel sheets make me happy. They instantly warm me when I climb into bed all tired and weary. Perfect for the cold winter months. 5~ I am so thankful for Monday nights with FHE. We learned about Service today. The joy of serving, and Keith is thrilled and excited to find acts of service. He is actually looking forward to sorting through his toys to give some to a less fortunate family. We just have to find someone who needs them. And as his mother I am thrilled, and proud, and humbled, and in awe of the goodness of his heart. Can't wait. It's a very cute idea, and if I ever stumble upon an old rustic ladder I will know what to do with it! Can't wait to see. I love Christmas- the music, the giving- I think I love giving gifts more then getting them, the food, the lights, and Temple Square! Mmmm. Lovely. I feel like Christmas just pounced on Thanksgiving... 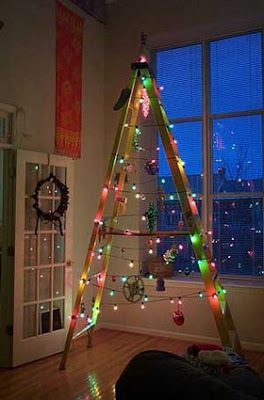 I love the ladder idea!!! Unfortunately my kids would climb it, break the lights on the way up and their necks on the way down :( I don't even know what we will do this year. Ok I love your ladder ideas. How cool and I love that you have decorated a few days early (in some opinions) and I love that the spirit is sweeping over you and well...I hope you enjoy the holiday season. Love the ladder. Love the new look around here. Love reading your stuff, as always. Good to be back. You are such a good Mom, Amy. And that ladder is classic! (I am in the warm, fuzzy, holiday mood myself. Good for you for getting in the Christmas mood early! Just because you're getting ready for Christmas doesn't mean Thanksgiving is forgotten. I'm with you, the two holidays just go together. I would put up my stuff now, but we keep Christmas up until January 6th--day of the Magi. So, I always wait until at least the day after Thanksgiving...sometimes until the first day of December. Ladder idea is so great. A Christmas ladder?! That's beyond awesome! I totally agree with you about the gimme spirit. I think that's what has made it impossbile for me to feel the Christmas spirit for the last few years. I resolve now to slowly inspire the spirit into my home. Kind of how it slowly creeped into yours! We usually start up Christmas stuff the day after Thanksgiving. But this year I have started early with the music. I want to immerse myself in the Spirit of Christmas!